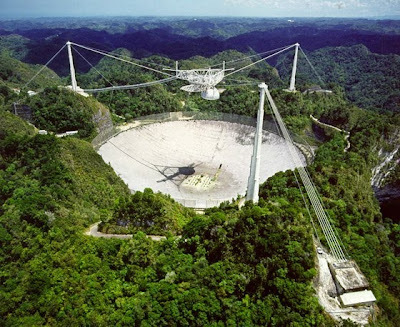 The Arecibo Observatory is a radio telescope located close to the city of Arecibo in Puerto Rico. It is operated by Cornell University under cooperative agreement with the National Science Foundation. The observatory works as the National Astronomy and Ionosphere Center (NAIC) although both names are officially used to refer to it. NAIC more properly refers to the organization that runs both the observatory and associated offices at Cornell University. The observatory's 305 m radio telescope is the largest single-aperture telescope (cf. multiple aperture telescope) ever constructed. 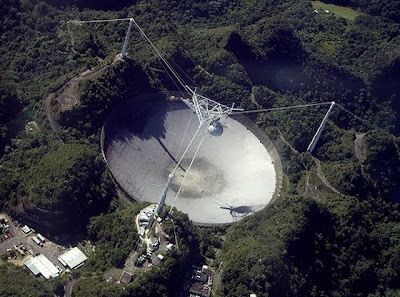 It carries out three major areas of research: radio astronomy, aeronomy (using both the 305 m telescope and the observatory's lidar facility), and radar astronomy observations of solar system objects. Usage of the telescope is gained by submitting proposals to the observatory, which are evaluated by an independent board of referees. The telescope is visually distinctive and has been used in the filming of notable motion picture and television productions: as the villain's antenna in the James Bond movie GoldenEye, as itself in the film Contact, the The X-Files episode "Little Green Men", and the docu-drama Super Comet: After The Impact. The telescope received additional international recognition in 1999 when it began to collect data for the SETI@home project. A detailed view of the beam-steering mechanism and some antennas. The triangular platform at the top is fixed, and the azimuth arm rotates beneath it. To the left is the Gregorian sub-reflector, and to the right is the 96-foot long line feed tuned to 430 MHz. Just visible at the upper right is part of the rectangular waveguide that brings the 2.5 MW 430 MHz radar transmitter's signal up to the focal region. 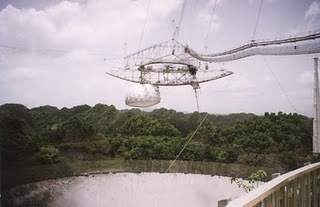 The construction of the Arecibo telescope was initiated in the summer of 1960 and completed in November, 1963, by Professor William E. Gordon of Cornell University, who originally intended to use it for the study of Earth's ionosphere.Originally, a fixed parabolic reflector was envisioned, pointing in a fixed direction with a 150 m (500 ft) tower to hold equipment at the focus. This design would have had a very limited use for other potential areas of research, such as planetary science and radio astronomy, which require the ability to point at different positions in the sky and to track those positions for an extended period as Earth rotates. Ward Low of the Advanced Research Projects Agency (ARPA) pointed out this flaw, and put Gordon in touch with the Air Force Cambridge Research Laboratory (AFCRL) in Boston, Massachusetts where a group headed by Phil Blacksmith was working on spherical reflectors and another group was studying the propagation of radio waves in and through the upper atmosphere. Cornell University proposed the project to ARPA in the summer of 1958 and a contract was signed between the AFCRL and the University in November 1959. Cornell University published a request for proposals (RFP) asking for a design to support a feed moving along a spherical surface 435 feet (133 m) above the stationary reflector. The RFP suggested a tripod or a tower in the center to support the feed. George Doundoulakis, director of research for the antenna design company General Bronze Corp in Garden City, N.Y. received the RFP from Cornell and studied it with his brother, Helias Doundoulakis, a civil engineer. The brothers devised a more efficient way to suspend the feed, and finally designed the cable suspension system that was used in final construction. The U.S. Patent office granted Helias Doundoulakis a patent on this approach. Construction began in the summer of 1960, with the official opening on November 1, 1963. As the primary dish is spherical, its focus is along a line rather than at a single point (as would be the case for a parabolic reflector), thus complicated 'line feeds' had to be used to carry out observations. Each line feed covered a narrow frequency band (2-5% of the center frequency of the band) and a limited number of line feeds could be used at any one time, limiting the flexibility of the telescope. The telescope has undergone significant upgrades. Initially, when the maximum expected operating frequency was about 500 MHz, the surface consisted of half-inch galvanized wire mesh laid directly on the support cables. In 1974, a high precision surface consisting of thousands of individually adjustable aluminum panels replaced the old wire mesh, and the highest usable frequency was raised to about 5000 MHz. A Gregorian reflector system was installed in 1997, incorporating secondary and tertiary reflectors to focus radio waves at a single point. 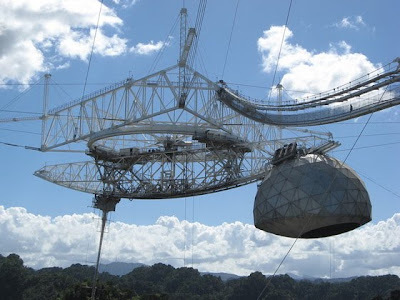 This allowed the installation of a suite of receivers, covering the whole 1–10 GHz range, that could be easily moved onto the focal point, giving Arecibo a new flexibility. At the same time, a ground screen was installed around the perimeter to block the ground's thermal radiation from reaching the feed antennas, and a more powerful 2400 MHz transmitter was installed.